Available August 1st, 2019. 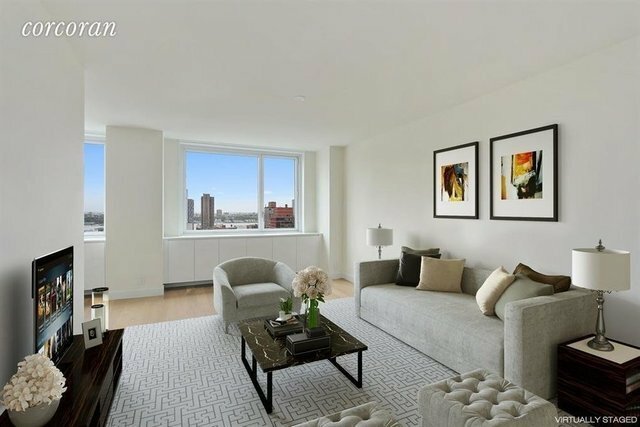 Bright, sunny and spacious 2 bedroom at the newly converted Fifty Third and Eighth Condominium. The unit features an open kitchen layout with beautiful white lacquered cabinetry, Quartz counter top and breakfast bar, Bertazzoni gas range, Bosch refrigerator, dishwasher and stainless steel microwave. The air conditioning and heating units are neatly placed inside the built-in lacquered cabinets in each room providing extra storage space. There's plenty of closet space including a walk-in closet in the master bedroom and a utility closet in the entry hall with a Bosch W/D. The second bedroom has a customized sliding door that allows for multiple openings to capture the light and beautiful city river views that can be seen throughout the apt. Enjoy the sunset every day from this superb unit. Feel at home and take advantage of the lovely amenities of this full-service condo . The building features a 24 hour concierge, live-in resident manager, a brand new fitness facility, garden, roof deck, bike room, laundry room, garage and valet services. Minimum one year lease is required with opportunity to renew multiple years. This is a smoke-free home located in the heart of Hell's Kitchen and just minutes away from Central Park, Columbus Circle, Times Square, MoMA and other great attractions.